Publicado el 6 diciembre 2011 enConference, Learning. 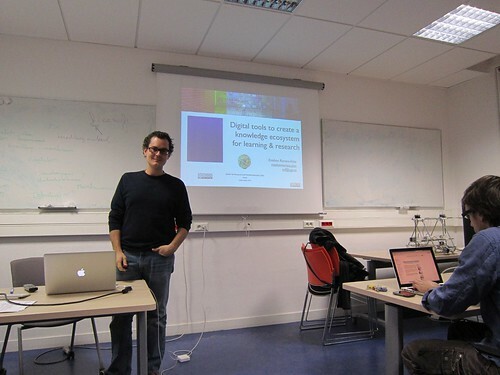 This article covers the content of the seminar that, today, December 6, 2011, I present at the Center for Research and Interdisciplinarity (CRI) in Paris, with the title: “Digital tools to create a knowledge ecosystem for learning and research”. The seminar introduces a global perspective on learning processes in order to integrate different webtools in a coherent and practical Personal Learning Environment (PLE). I will use my own PLE to illustrate the practical role that a diverse array of webtools play in my learning process. Below you can find the presentation, videos and links to be used in the seminar. ¿What is Personal Learning Environment? A vision of students today, by Mike Wesch and students. Isaac Asimov predicted the Internet of today 20 years ago, interviewed by Bill Moyers in 1988. Digital Humanities and the case for Critical Commons: a Downfall detournement with Bruno Ganz holding the line against digital scholarship and fair use, courtesy of Critical Commons. Science Commons, by Creative Commons. Bertrand Russell – to our descendants: a short extract from the BBC’s Face to Face interview of Bertrand Russell. Use open licenses for your content: Creative Commons. Analyse your visits: Google Analytics. Who is linking you (who is giving you visibility): Alexa. There are two main options: to install the software in your own server or to use an online service. Case 1) Wiki installed in your own server (Descuadrando.com, the Open Business Encyclopedia, based on MediaWiki, the software used by Wikipedia). Other example: City Wiki (UGR). Case 2) Wiki in an online platform that offers free wikis, Wikispaces (advise: consider using the educational license for free additional features). Examples: Web2Empresa, a personal wiki to collect information about Web 2.0 and their applications; Wikimove; GrinUGR. There are services that allow you to disseminate and create presentations. Also the possibility of embedding the content in a website is very useful. CRI related users: @francoistaddei; @CRI_FdV_AIV; @fabelier; @mazieres; @cybunk. Lists: Instituciones; Berlin Symposium; French culture. In my opinion, Twitter is a service that is mainly based on sharing bites of information in a very quick, flexible and transparent way, allowing users to interact among them without being previously accepted as “friends”. The relation between two users can be asymmetric, this means that you can be my follower but that doesn’t imply that I follow you, or in reverse. There are many third-party services that provide statistics and other information about users in Twitter. For example: Twitter Counter, Mentionmap, Tweetsheet, etc. Mollett, Amy and Moran, Danielle and Dunleavy, Patrick (2011) Using Twitter in university research, teaching and impact activities. Impact of social sciences: maximizing the impact of academic research, LSE Public Policy Group, London School of Economics and Political Science, London, UK. Pages: Yo también soy fan de los comedores universitarios de Granada; Colegio Oficial de Titulados Mercantiles y Empresariales de Granada; Seminario Web 2.0 en la universidad. Groups: Internet desde las Ciencias Sociales; Les Cours de Civilisation Française de la Sorbonne; Docentes. Groups: e-Learning, LMS y PLE en dispositivos móviles: mLearning. Groups: Future of Science; Games, Virtual Worlds, and CyberSociality; Reinventing the Scientific Paper. These services allow to create private SNS with the same features that main SNS have, such us Facebook. The advantage is to control the characteristics of these networks in order to create a suitable environment for learning or to restict the access only to a community of people. I used Ning in 2009 and 2010 for my course on International Accounting. Then Ning became a premium service and I decided to make the project evolve and explore the idea of Personal Learning Environment. In my opinion, restrictions are often a source of creativity when you have alternative resources to design new environments. Grouply is a premium service that offers an educational license for free. It was the alternative choosen instead of using Ning but finally we accepted the challenge of opening the knowledge creation process using PLEs instead of any kind of Learning Management Systems (LMS) or closed SNS. Another well-known service is Bloglines. Origen: 1) Descuadrando in Wikispaces, 2) Descuadrando in Tikiwiki. The initial project emerged from a course in International Accounting. The system didn’t generate the expected results in terms of interaction among the students and, therefore, we transformed Descuadrando in a project to transfer business knowledge from the university to the society. Currently the project is open to any kind of actors, being students and academics the ones who have contributed more intensively to the platform. Some pages to visit in the encyclopedia (in Spanish): Welcome, ¿What is Descuadrando?, Corporative image. Steban! Grande espaço! Esse post é um achado de tão rico para aprendizagens! Vou compartilhar e voltar! Feliz 2012!